The first yacht of the J Class-inspired sailing yacht Tempus class series designed by Rob Humphreys has just been launched by Arkin Pruva Yachts and christened Tempus Fugit. 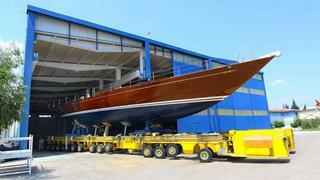 Commissioned by yard owner Erbil Arkin, the 27.4m Tempus 90 is the first of a series by the British studio to be built at the Turkish yard. The low deckhouses of the Tempus 90 echo a traditional J Class yacht styling, but the freeboard is a little higher and the 5.6m-beam relatively wider, allowing larger accommodation and a more practical liveaboard cruising interior. Tempus Fugit is cold moulded with epoxy resin and the rig is a contemporary sloop with slab reefing, swept back spreaders, a short top mast, fixed backstay and self-tacking headsail for cruising. The lounge area, open plan galley and guest cabins are forward and the master lies aft. To reflect the era of classic sailing, the galley and all bathrooms are fitted out in marble and solid timber panels are used generously throughout.